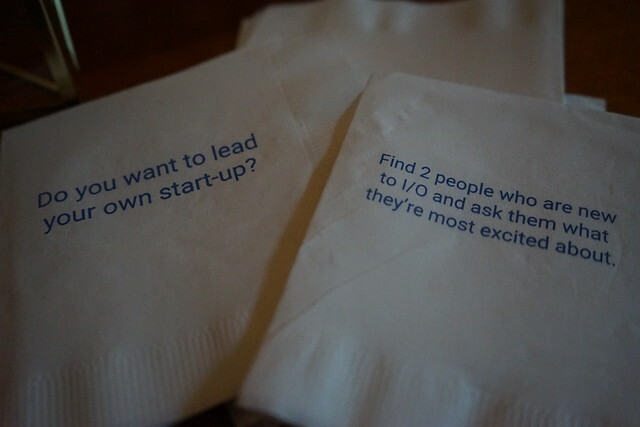 When I joined Google back in 2010 as Developer Relations country lead for Japan, I started asking around to developers what they saw as an issue, what they wanted to us to resolve to make their lives better, etc. One of the feedbacks I got from a woman was that she went to Google's developer event that had a couple hundred developers and she thought she was the only woman there. There probably was more than one- she probably just happened not to meet others, I don't know. But it definitely was the problem that had to get resolved. As I started to look more closely, I realized there are so few female developers in Japan, and much fewer of them comes to developer events. When I asked some of them why this is the case, one of the reasons they mentioned was that when they go to developer events, it is full of men and they are often the only female there, feel lonely and don't want to go any more. It was a bad cycle. 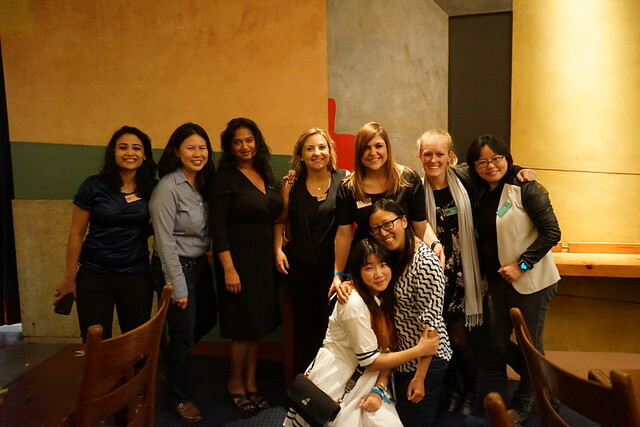 So I started making women's developer community in Japan - started running women-only hackathon and codelabs, started GTUG Girls in Japan (Google Technology User Group). We worked to increase the number of female attendees for "Google Developer Day" conference I organized, as well as tried to get more women speakers. In fact, we had 50% female speaker ratio for GDD Bootcamp in 2011, woohoo :) We also started increasing female community leaders- among the 9 GDG (Google Developer Group) /GTUGs in Japan, all managers were men when I joined, and by 2012 we increased that to 3 women managers so that's 30% women leaders, woohoo :) It all really takes time to make happen. I was recalling about those old days today... while I was reading this article on USA Today "Google I/O attracts more women" based on an interview with my colleague +Natalie Villalobos who is a wonderful Googler, works as "women in technology advocate" at Google. In 2013, Google I/O only had 8% women. After she became the advocate, that number increased to 20% in 2014 and 23% this year, making huge progress. To ensure women are comfortable coming to the conference, Natalie and the team has been working on many initiatives such as making sure there is child care and mother's rooms at the venue. Starting a Slack community for women going to I/O so that they can communicate with each other. There is going to be an all-women's panel called "Engineering for the Stratosphere", with 5 women from Project Loon talking about engineering for the stratosphere. Making a new community guidelines banning harassment at I/O. 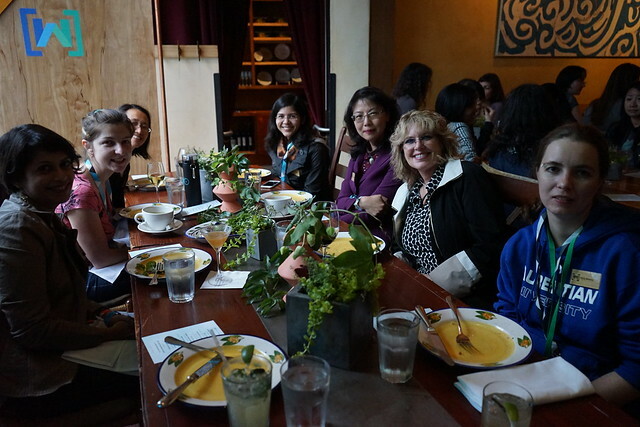 The team also invited all of the women joining Google I/O to a dinner the day before I/O starts- this is important because we want the women to meet their fellow women participants before the event starts, so that when they step into the conference venue surrounded by (still 77%) men, they'll see some familiar faces and feel more comfortable. 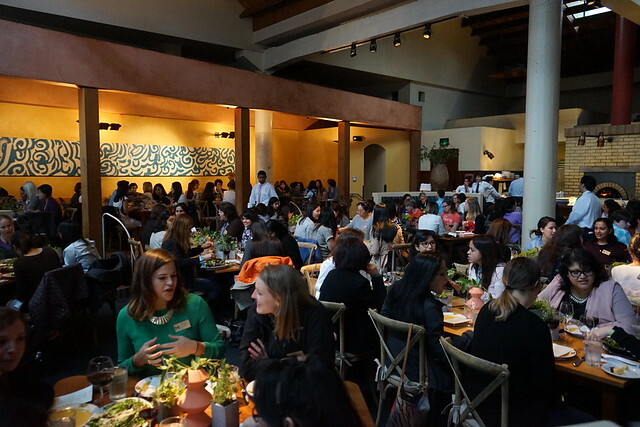 The dinner is also a place where you can sit down and actually talk with other women in tech - not rushing through sessions or yelling to each other in noisy corridors or after parties.... a place where you can relax and have meaningful conversations to get to know each other. 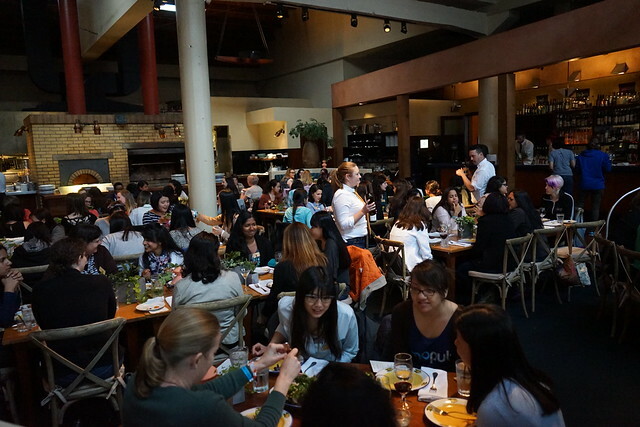 There is no way we can get a restaurant in San Francisco for all the women participants, so we had 6 different (and awesome) restaurants booked, at Lulus where I was helping to organize, we hosted around 150 women. 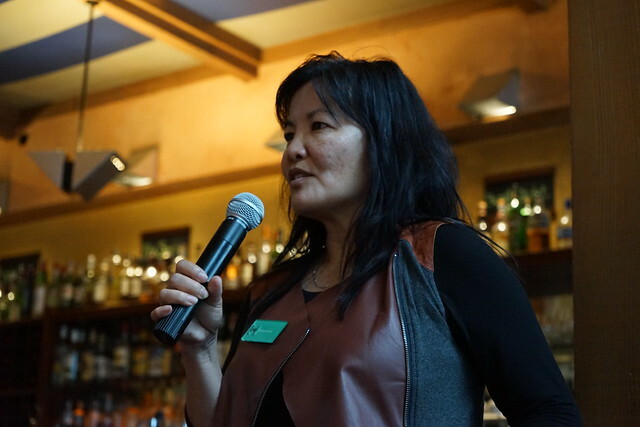 Margaret Lee, Director of User Experience Design giving opening speech. 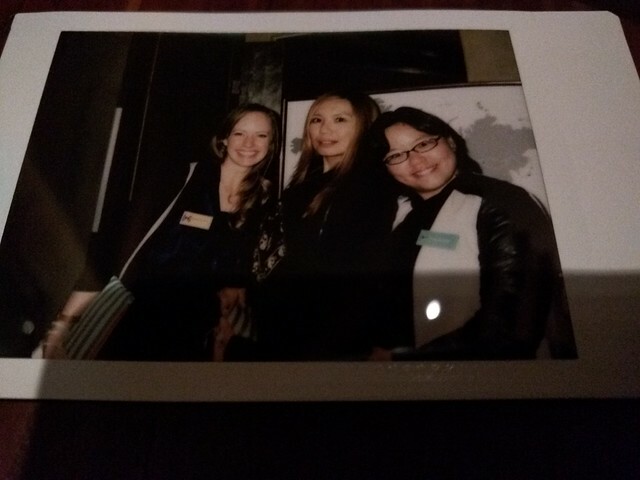 Polaroid with Dharmishta and Tomomi. 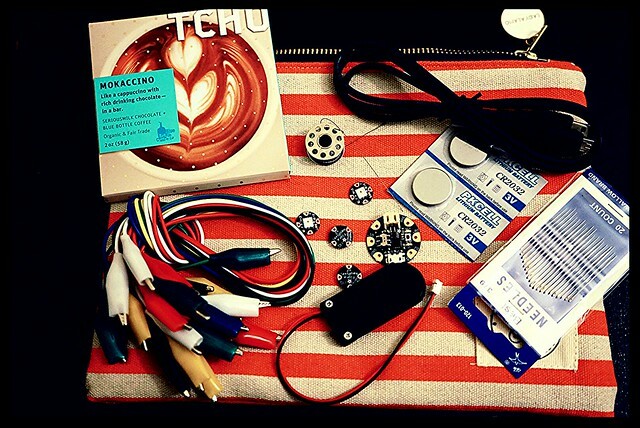 Gifts included a TCHO chocolate, Lady Alamo pouch, and Adafruit's Gemma Starter Pack. I love it!
" Engineering for the Stratosphere"